Fermi wave vector (Fermi wavenumber). Finally, we have provided a table of the number density of free electrons in some metals, which you can use in this calculator. The Fermi energy is a physical quantity which is used to determine the maximum energy of an electron in the absolute zero temperature (0 K). All energy levels up to Fermi level are occupied by electrons, and all above levels are unoccupied (you can read more about energy levels in Bohr model calculator). The existence of the Fermi level is a consequence of the Pauli exclusion principle, which states that two fermions, e.g., electrons, cannot be in the same stationary state. Fermions are particles that obey Fermi-Dirac statistics and have spin s = 1/2. You should check our magnetic moment calculator to read more about spin. In other words, the Fermi level is the surface (sometimes called Fermi surface) at absolute zero temperature below which no electrons will have enough energy to rise above the surface. To find Fermi energy, we can imagine that we have an empty system, which we want to fill with electrons. We add electrons one at a time, which will consecutively take further places on stationary states with the lowest energy. When all the electrons have been put in, the highest electron energy level is Fermi energy. However, at higher temperatures, a certain fraction of electrons will have high enough energy to exist above the Fermi level. The number of those electrons can be estimated using the Fermi-Dirac distribution. k is the Boltzmann constant k = 1.38064852 * 10^(-23) m² * kg / (s² * K). Did you know that energy can be expressed in many units? Not only in joules but also calories and kilo-watt hours or even in Kelvins and kilograms! Check our energy conversion to find out how can you compute energy in different units. As we stated in the previous sections, at the absolute zero temperature, every single energy level below the Fermi surface will be occupied, and every energy level above the Fermi surface will be vacant. You can check whether this is true with our Fermi level calculator. Increasing temperature will change the situation - some electrons will rise above Fermi energy. Nevertheless, if the energy of the particle equals Fermi energy E = Ef, then f(E) should be exactly 0.5 regardless of temperature. Most metals are good electrical conductors - we use this fact in electronics. The behavior of their electrons can be very well described with the so-called free electron model. It considers electrons as an electron gas with no mutual interactions between electrons (analogically to Fermi gas). 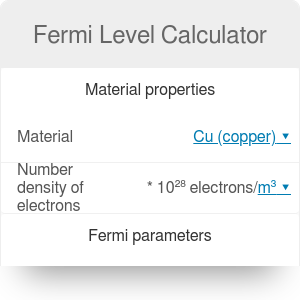 In the table below you can find number densities of some typical metals (or you can use number density calculator to compute it yourself) which can be used in our Fermi level calculator, just select any material. You should also check drift velocity calculator to find out what is the speed of electrons in cables. Fermi Level Calculator can be embedded on your website to enrich the content you wrote and make it easier for your visitors to understand your message.